“We just adopted a girl from South India and she was fed idli’s and rawa idli’s. So we would like to try making them for her and our family as well. I have bought all the idli trays and the pressure cooker. All I need now is a recipe. 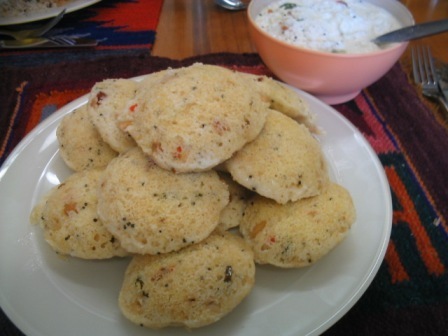 Idli are the ubiquitous bread of South India. Although often made of dal and rice, the semolina version is easy and popular. Sambar dal and coconut chutney are the eternal marriage partners of idli. Enjoy the combination for breakfast or brunch and discover the magic. They are steamed in an idli mould – a rack stacked with trays that looks like egg-poaching dishes. This recipe makes 16 idli, so look out for a 4-tier stacker that holds 4 idli per tier. Heavily oil the idli steaming trays. Set them aside. Heat the ghee in a frying pan, add the mustard seeds and fry until they commence popping. Add the dal, chili and cashew mixture and fry until the mixture darkens and becomes aromatic. Set aside. Combine the semolina, baking soda and salt and mix well. Stir in the yogurt. Add enough water to form a smooth batter that will almost fall from a spoon but is not too runny. Stir in the fried mixture including the ghee. The raising agents plus yogurt will aerate the thick batter. Immediately spoon approximately 2 tablespoons idli batter in each compartment. When all the batter is used and each of the compartments are three-quarters full, lower the racks into a tall saucepan or stockpot (the lid has to close tightly for the steaming to be successful). Steam over medium heat in the large covered pan with 2-5cm water in the bottom (the water should not touch the batter and should be boiling before the batter compartments are lowered in), for 10-12 minutes, or until a skewer inserted in the middle comes out clean. Remove the steaming racks. Cool slightly before carefully prising out the idlis with a large spoon. Serve while warm with sambar dal and coconut chutney. They can be reheated by steaming.